We were mostly kidding when we said that Tom Hiddleston should dress up as all the Avengers, but now we’re pretty sure he’s actually already done it. 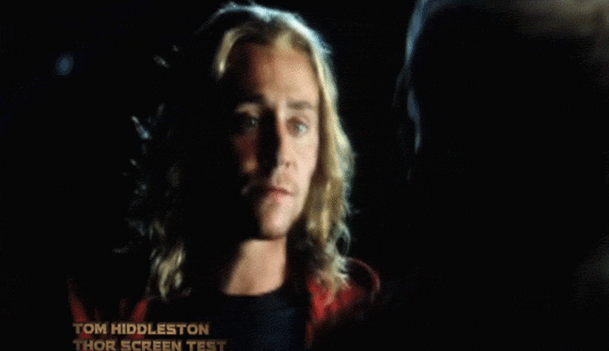 Case in point: the Thor: The Dark World blu-ray extras not only include Loki as Captain America, but also show screen tests of Hiddleston auditioning for the part of Thor. Unfortunately we do not have video of this miraculous event, but Superhero Movie News got these GIFs, and really, aren’t those better? They’re much easier to watch over and over again, for one thing. And like we said, he’s shirtless in one of them, so that replay-ability is… important. Yes. He’s definitely got the movements and the hair down for the character, but it’s weird thinking of Hiddleston legitimately trying to audition as Thor in the first place when he’s so perfect as Loki. And while we’re sure that Chris Hemsworth wasn’t as buff as he now is when he auditioned for the role, too, it’s also doubly weird to see how much slimmer Tom is in comparison. Not that he isn’t muscular in these GIFs, of course. It’s just that he’s, you know, different. And blond. Anyway, you should know that we expect to see Tom Hiddleston in all the Avenger outfits, now, Marvel. You’ve given us two already, and we know Tom is probably up for it. We’d like a Hawkloki first, please. Make sure he says something about how much he loves arrows, too. The DVD and blu-ray of Thor: The Dark World come out on February 25th.